It's no secret that I am obsessed with my living room and the way it turned out. A few weeks ago I posted a tour on my channel of how it turned out but I never posted a blog post (until now) with the pictures revealing anything and everything about my apartment key pieces. Laurel & Wolf covered an article on their blog about my space but I wanted to share all the pictures with you that Cody, my sweet and talented boyfriend, took for me of my space! I also wanted to help you guys potentially find cheaper alternatives for some of the things in my apartment, as I know decorating a space can get very, very, very expensive. I get a lot of questions about the console table where it's from and actually I was very surprised when the interior designer sent it to me for approval to find out that it was from CB2! Granted it is more expensive than I was expecting to spend on a console table but since it's a big focal point of my apartment, I justified it. I did find a cute alternative that is much cheaper than the CB2 from World Market that I was looking at before hiring a designer with L&W! As for the decorations on the console table, that's all from Home Goods AKA my favorite store ever! I found these basket stands when I was home in Cincinnati at the Home Goods there and nearly died when I saw them. So. Freaking. Cute. I'm not over it. The Himalayan salt lamps are also from Home Goods, you can basically find them at any store. I found an alternative at Urban Outfitters that's also available in a different color too! Next to the console table is this chair that I purchased a while back from Target. It's no longer available but World Market has a dupe of it and it's not much more than I paid for mine. 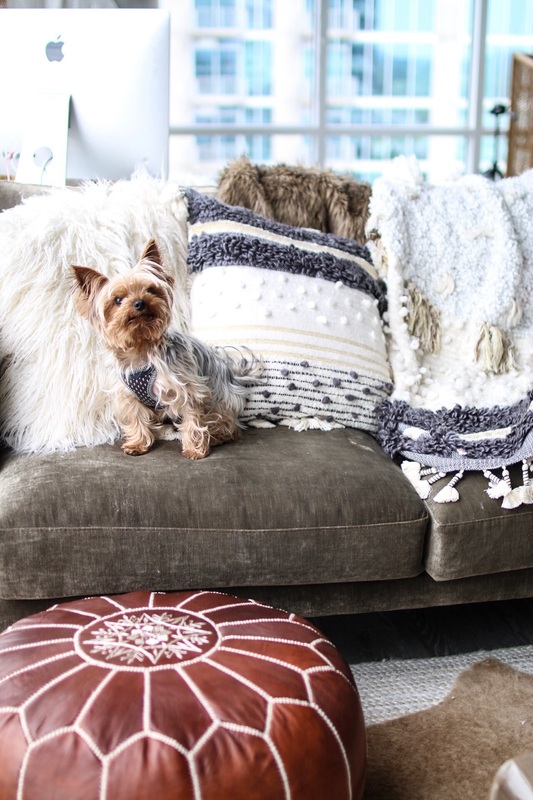 I love the look of wishbone chairs and the fur adds a little more glam to it! I added a fuzzy blanket that I bought at Home Goods and Moroccan Wedding Pillow from Anthropologie on top of it. To act as a foot rest, I have this adorable Moroccan pouf that is quite the splurge but worth it! I ordered what I thought was a dupe of it and it looked so cheap and dirty compared to the real thing. 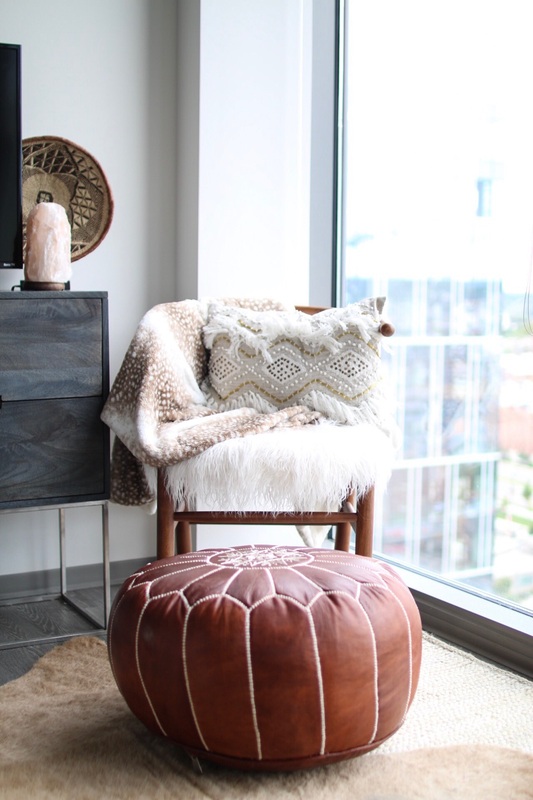 I would suggest if you want a cheaper version of this pouf, to purchase it from West Elm for about half the price of this one! Oh my lawddddd, oh how I love this couch. This is probably the most expensive piece of furniture I'll ever own but by gosh, by golly, it's gorgeous. The slub velvet is to die for. I am not going to recommend any other velvet couch on the internet because I know that velvet couches are hard to find so I'll just leave it at that. To protect my couch from Millers paws, I've layered a bunch of different pillows and blankets. 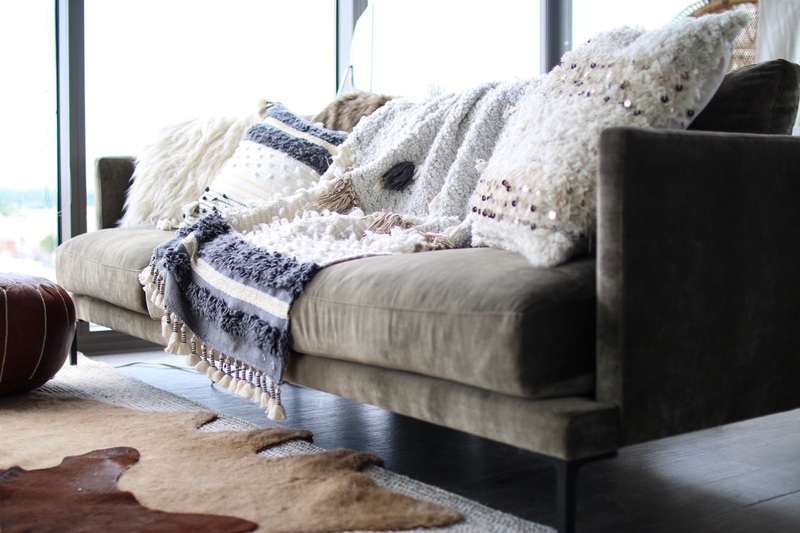 Not only is it protecting the couch, but it's also adding a lot of texture to the space. All my pillows are from Anthropologie. I think you can style any couch and make it look fab with Anthropologie pillows. Worth the investment. 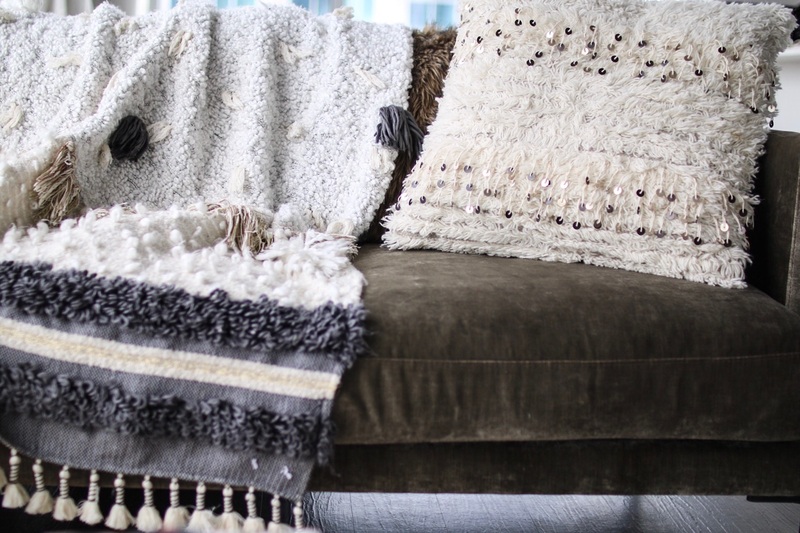 The fuzzy ones are from Anthropologie but you can find similar pillows basically at any TJ Maxx and Home Goods. The coffee table and rugs! How aggressive is it that I have 3 rugs in such a small space? Don't answer that question, just let it happen. 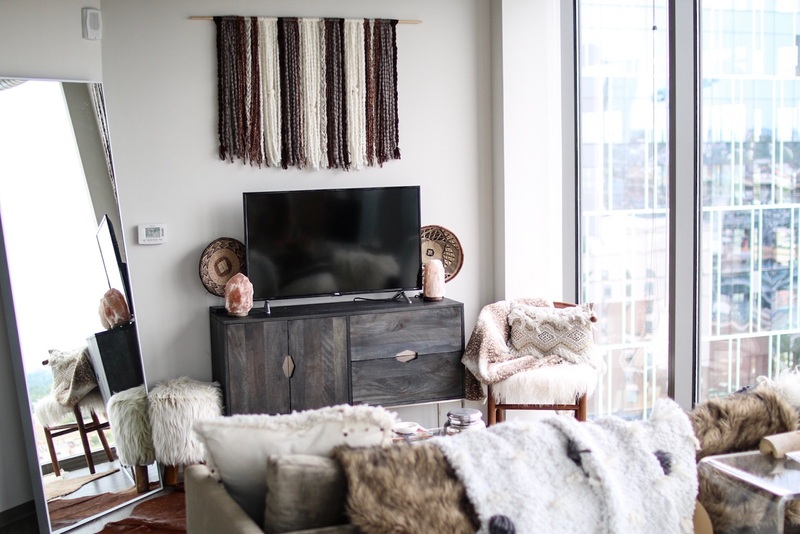 Originally the designer had it just as the light cowhide rug layered on top of the jute rug but I added my old cowhide rug to add some more color into the room and I love the look of it! You can never have too much cowhide I guess! The coffee table is from CB2 but you can find acrylic coffee tables basically anywhere these days. I know you can find them at World Market for cheaper than CB2, so if you're interested I have that linked here! On top of the table, I have this little bone inlay box I found at Home Goods, it was a steal for bone inlay anything! 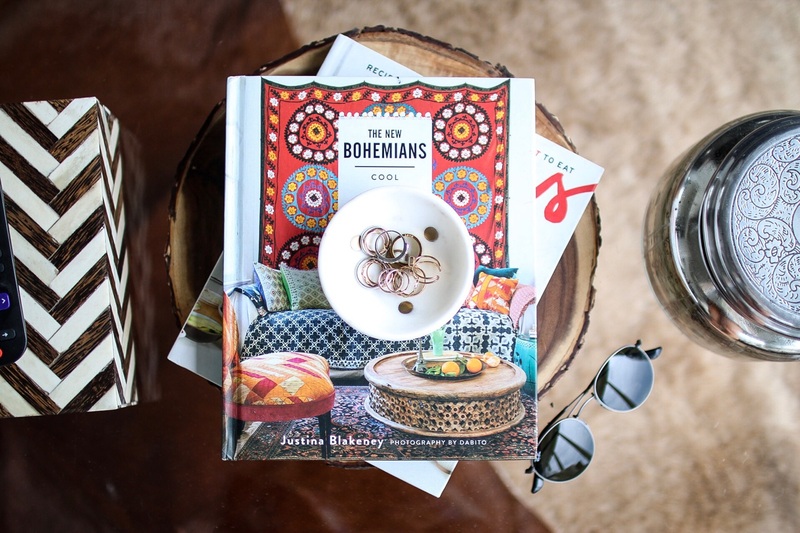 Then I have my favorite coffee table books out, my all time favorite one is this book called The New Bohemians because it has major design inspo in it. I read this book by the pool... no joke. And finally, what tour would be complete without an Anthropologie candle? I live for the Capri Blue Volcano candle that makes your apartment smell like an Anthro store. It's a dream come true for my nose. Wow, I really sold you on that candle, didn't I? I'm obsessed!! Are you going to do one of your bedroom too? Please do a bedroom tour:) and bathroom. Love the way the liviyroom turned out. Love this apartment and you!!! I'm actually moving to Nashville this month and don't know a single person! Any advice on how to meet people in a new city?? I moved at almost the same time as you and I've been obsessed with your living room. Totally copied you, but imitation is flattery right? Haha ��. Thanks for the posts; I love your blog! I love this! I just moved and this is giving me so much inspiration! Love this and love you!! agree! full apartment tour would be awesome!!! PS- I'm obsessed with you and your style, you're amazing!!!!! Interior Define has unreal velvet sofas - legit my dream furniture! Hi sarahbelle!! My IG is danielalrm! Keept it up with your blog girl! I love your style! Love Love Love your style.. and I got my first cow hid rug. I hope to get a second one soon! I absolutely love the fact that you shared more affordable options in this blog post! It's so hard to shop for decor and furniture on a budget. Definitely going to look into getting myself a Himalayan salt lamp because I think it'll add an earthy tone to my room besides brown! Going into fall semester, senior year is a scary thing, but that planner would be perfect for it! Also, your new home is so beautiful! Love everything in your living room!! 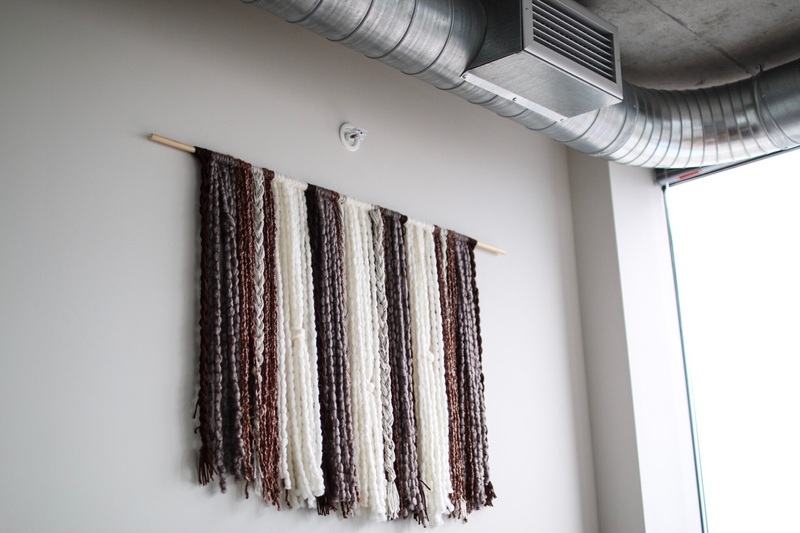 I NEED to make one of those DIY yarn wall hangings. So so cute! I made a yarn hanging kinda like yours and I love it too!!!! Love the Himalayan salt lamp!! I am 22 just got my own apartment and I love your style! Longtime follower and YouTube watcher! In love with your apartment decor! And Miller :) so so so cute. I'd love to win! I need an agenda for my hectic life! I love the throw pillows! I've just graduated from college, and I'm looking at different types of furniture for a new place. How do you like the velvet sofa? I've been debating what kind of fabric to get. IG username is @agreenlee_ ❤️❤️ Obsessed with your apartment!! I really love all your stuff, and I have followed you since ever. Love this post and your style!! took me forever to find the comment button lol. Love you!!!! You inspired me to create my own blog! ( amadisonclassic.wixsite.com/welcome ) Winning this planner could help me get organized and plan future blog posts! Love you!! I've been following for a few years now and I love how your style has changed. Love the new space! I love how you've transitioned so gracefully from college to now! i wanna see how your bathroom is set up! Love the vibes in your apartment. I've followed you for so long, its so cool to watch your style evolve as you grow. Love your videos and new blog! So jealous of your ability to put decor together. I have no sense of interior design at all. Haha. In love with your living room decor/space!! Love the blog & you! I've been following you for so long and I love that you did a video for post grads! All of this apartment decor is perfect since I'm moving into a new one next week. So cute!!! I love your apartment. It looks and feels cozy! you're literally living my dream life!! after college I hope I can move to nashville and I hope my apartment can be half as cute as yours!! Your apartment is so cute!! The way that you decorated it has definitely given me some inspiration on how to decorate mine! I love those throw pillows! Oh my all of those textures look so dreamy!!! You give me so much home decor inspiration! Truly goals. Your blog is what inspires me to write and potentially start my own blog! I've been a fan for a long long time and would love to win a new planner for going back to college.. 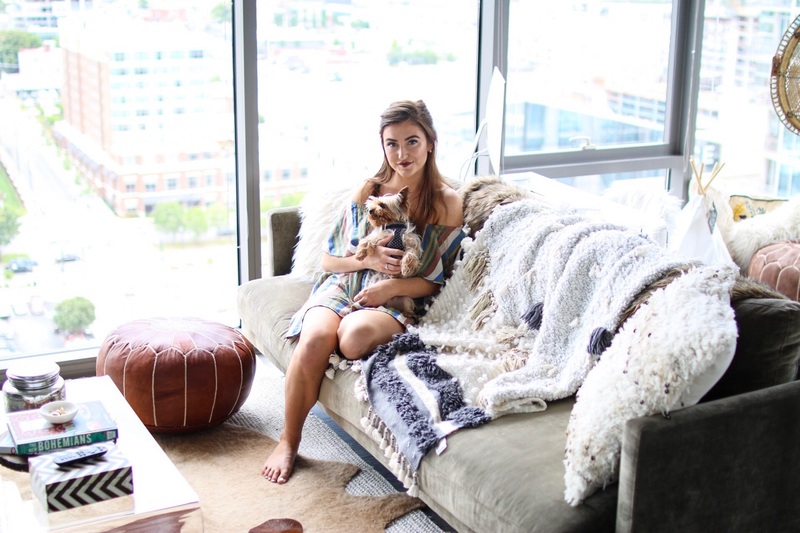 I'm not a boho style girl... like at all but I love your apartment! Just watched your planner video and I totally agree with you on the planning out weeks thing, it's so hard to find a good planner when you don't need to write something down every single day! Makes me want to design one myself. GIRL.. I am not usually a blog reader but I am LIVING for yours. Keep up the hard work!! I have loved to watch you and your style evolve since I started watching you when you were still in high school! Your living room is beautiful, I can't wait to see how the other rooms turned out! Stay fab Sarah! Absolutely beautiful!! Got some inspiration for my apartment. 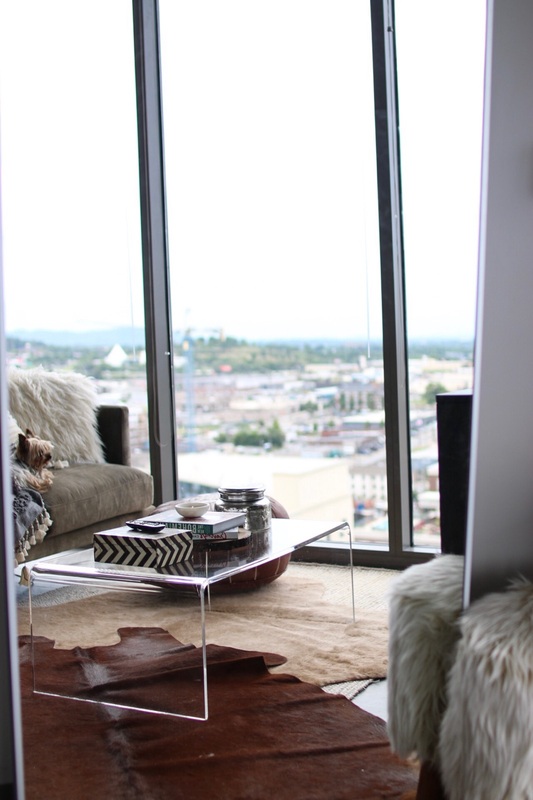 Seriously so in love with your apartment! 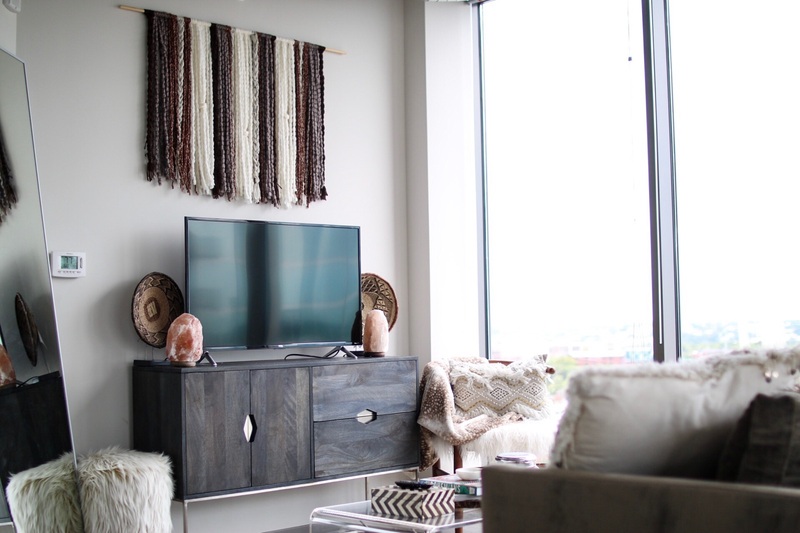 Love the way you made your modern apartment a boho paradise. Ahhhh! Sarah, your apartment living room is so cute!! I must check my local home goods!! I am from the Cincinnati area too, how crazy would it be to run into you in OTR. Big fan, love you! Ugh, you and Caitlin moving at the same time as me is both a blessing and a disaster because I want to start over in this new place with a cohesive style and I am loving the vibes from both you guys! Please, please help feed my post-grad planner obsession. yes so glad you linked to your blog as a step, I'm now obsessed & am binge reading. It's so fun to see your fashion and home taste change as you get older. I still remember J. Crew Hauls in your teal bedroom! I'm honestly obsessed with your sense of style, I LOVE IT ! Love your videos and blog!!! You've come such a far way since your preppy college years. Same you, but with more of your southern roots and I love it! Would love to see your whole apartment!! Your blog is beautiful! I love your style! Hi Sarah I love you!! I love every single part of your living room! I can't wait to see how you decorated your bedroom! I'm obsessed! I'm going to need you to come decorate my place now. I'm student teaching in a few weeks and graduate in December! So excited!! Literally took everything in my power not to buy everything from Paper Source now that I graduated. Also, such a cute DIY hanging! Love the entertainment center. It is beautiful! the pillows are so cute! Your apartment is literally everything I aspire to have. Legit goals for when I buy a house. Hi! I'm a college student in Kentucky at WKU! I would love your giveaway planner for all of my sorority planning! Your apartment is GOALS btw. My roommates and I are using it to help us decorate our apartment this year! love your blog and your youtube videos!! You apartment is absolutely stunning. I love it! LOVE all the decor! My favorite item is deff the Moroccan Pouf! So cute. Love your videos and blog posts! Life Replica specialises in superior replica and custom made furniture and lights. Our range has been expertly curated to enable you to get the latest progressive and stylish products from throughout the world. Life Replica specialises in superior replica and custom made furniture and lights. We are providing Featherston Chair since many years with good price and quality. Our range has been expertly curated to enable you to get the latest progressive and stylish products from throughout the world.